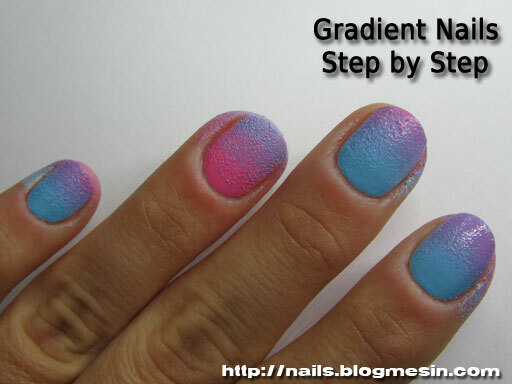 Last time I was posting tutorial for a Gradient Nails (Gradient Nails Step by Step – Part 1). Today I have the photos of the finished nails to show you. After all the steps described in the previous post, I covered the nails with three coats of a top coat. I was taking these photos in a sunlight. In artificial light the colours were a little bit more neon. 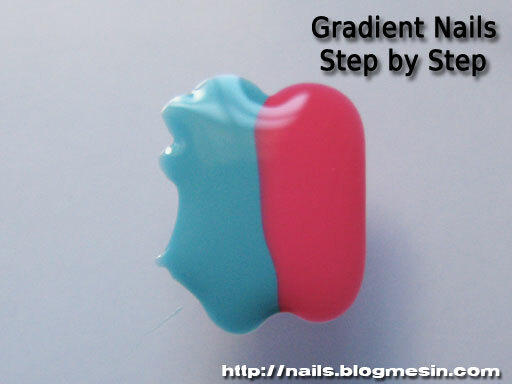 Not so long ago Melissa from super cool Kiss & Make-up Beauty Blog asked for the tutorial how I make a gradient nails. I will show you step by step my way to make them. 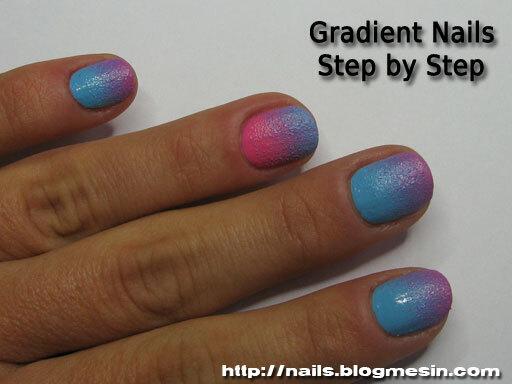 Choose the right colours for your gradient mani. You may want to experiment first with the colour mixtures because it is not only about how the colours look together but also what colour you get when you bledn them. 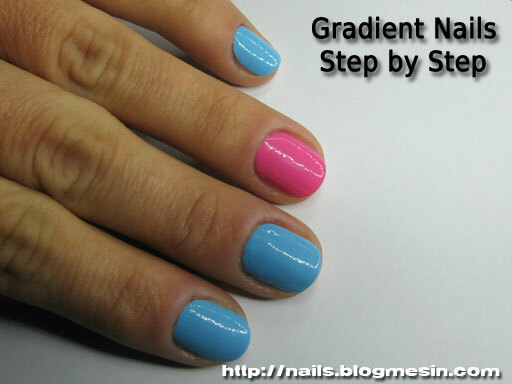 In this tutorial I am using blue for a base colour and pink for a gradient. Mixed together they create lovely violet. 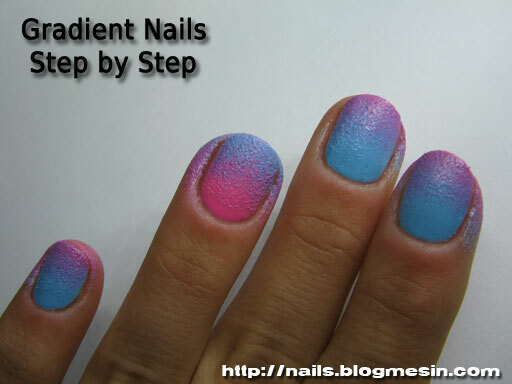 On one nail I reverse the colours, use pink for a base and blue for a gradient. 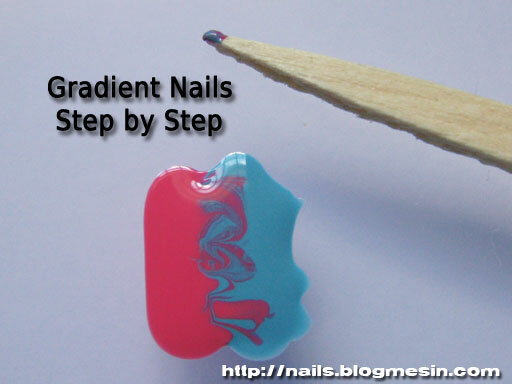 Paint your nails with a base colour and wait until the nail polish is completely dry. Put two small portions of a nail polishes (your base colour and another colour you chose) next to each other like you see on the picture below. The width of this stripe of lacquer should be more less the width of a nail. Now take something to mix these polishes. I use a toothpick, but it can be anything you find useful. Blend the polishes at the edges where they touch. Take a piece of a sponge and dip it into the polish. The polish transfers to the sponge. You can use any type of sponge you find. I am using one for washing a dishes, but I read that some girls are using a makeup sponge. I cut it into a smaller pieces which last for many manicures. Check if there are no loose fragments of a plastic detached from a sponge during the cutting. To get rid of them I wash these pieces in a water and let them air dry. 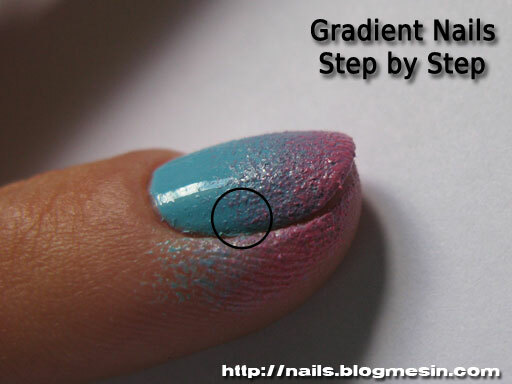 If you do not remove these fragments they transfer onto the wet nail surface. Removing them from the nail ruins the mani. On the photo below you can see how the pattern transfers onto the sponge. This pattern depends mostly on how you mix the polishes. 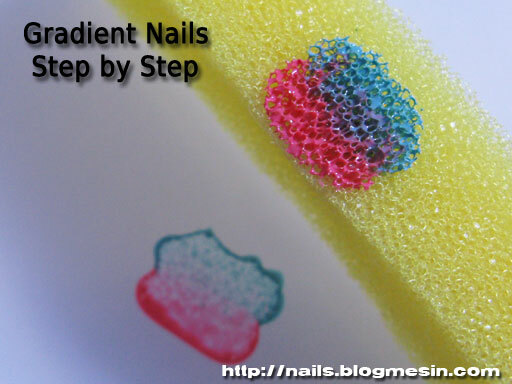 Now press the sponge onto the dry nail and rock it a bit (like you do with the Konad stamps). 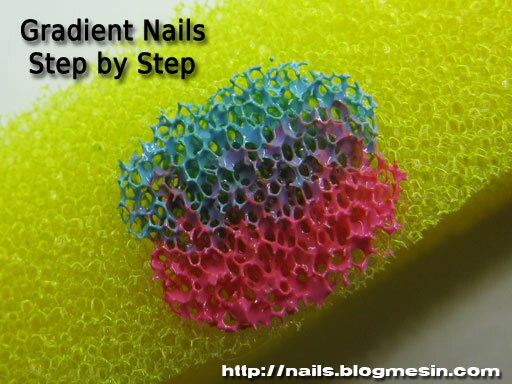 If you see that some areas of a nail need more colour, gently dab the nail with the sponge in these places. It will not only improve the coverage but also mix the colours creating nicer gradient pattern. If the polish is not transfering so good you may press the sponge a little bit harder or it means that you applied to small portions of the polish. Don’t worry about all this mess arround the nail. You will take care of it later. Important thing is to turn the sponge so the pattern is not upside down. I know that this advice sounds silly, but I already pressed the pattern wrongly 🙂 You can use the same piece of the sponge for all the nails. On the photo below you can see my nails after first application of a gradient pattern. Look at the right and left side of the nail. I marked this area with the circle on the picture below. When you press the sponge onto the nail it may not always cover this area, so dab it a little bit more there. If you like you may apply the pattern a bit higher on the sides creating a smile (like you do when you make french nails). When all the nails are covered with the gradient pattern wait until they are dry and repeat the sponging until you are happy with the look. Now remove all this mess from the skin around the nails. It is convenient to use a nail polish corrector pen. Unfortunately I don’t own any so I use nail polish remover in a standard way. Try to get the cosmetic cotton pads which don’t lose fibers. These fibers may stick to the wet nail surface. Removing them creates ugly grooves in the gradient pattern. On the photo below you can see how bumpy is now this mani. I cover it with a top coat. Sometimes I need to apply three coats of a top coat to get the smooth surface. It takes so long to dry so I rather apply two coats and leave the nails a bit bumpy. 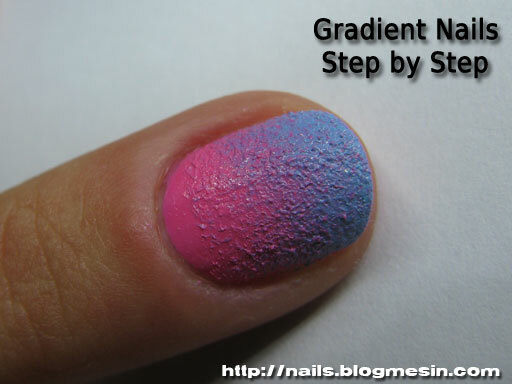 As you can see the gradient mani is really easy, but takes long time because all these coats of polish need to dry. This post is probably the longest one I have ever written, so the photos of the finished nails will come in the next post. 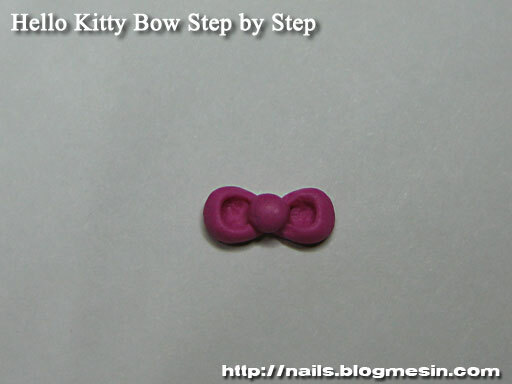 Today I will show you how I make my homemade Hello Kitty Bows from polymer clay. They are easy to make and you don’t need any special skills. So here is a step by step tutorial. Prepare polymer clay in any colour you like. 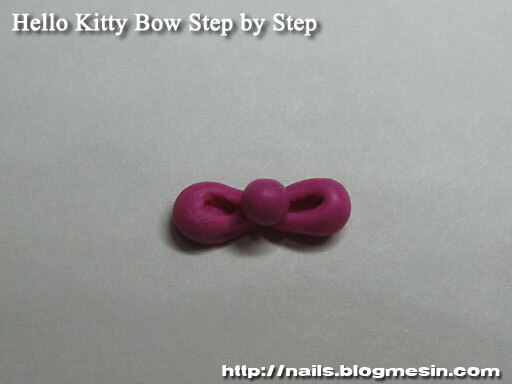 You can make many bows in different colours in the same time, just remember to use same type of polymer clay. Polymer clay from different producers may require different baking time and temperature. You also need some small tools to shape your bows. Here I am using wooden toothpick and orange stick. They are both leaving a little bit of texture on the clay. I like this effect, but if you want your bows to be more smooth use for example a dotting tool. It is good to have some tweezers also. Make three small balls of clay. Two of the same size for a bow loops and one half the size for a bow knot. On the photo you can see a toothpick so you can imagine how big the clay portions are. Take one of the bigger balls and make hole in it. I used the flat end of the toothpick. 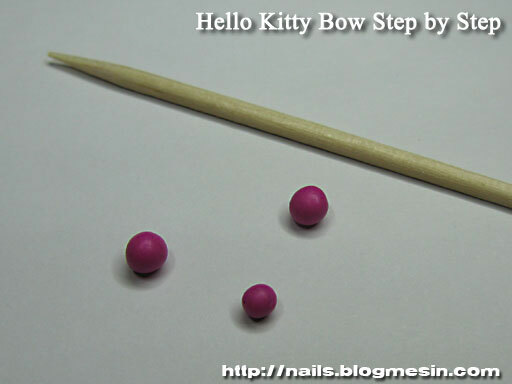 Using two sticks shape the clay like on the photo and repeat these steps with second bigger ball of clay. Place the bow loops together. 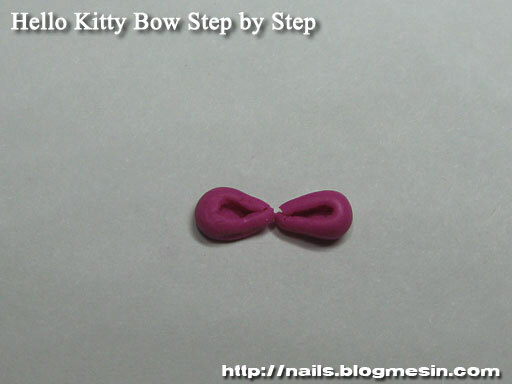 Take the smaller ball of clay and place it on the top of a bow loops. The bow doesn’t need to be perfect now, just make sure that it’s symmetric. Now important part. Shape your bow. The bow is ready, but it’s flat on the bottom. If you cure it right now the bow loops will stick out from the surface of the nail. 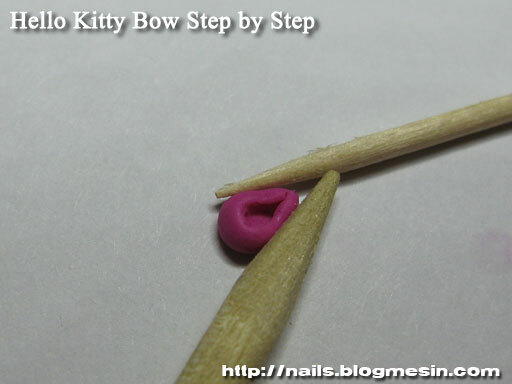 You can give a curvy shape to your bow by placing it on a nail. 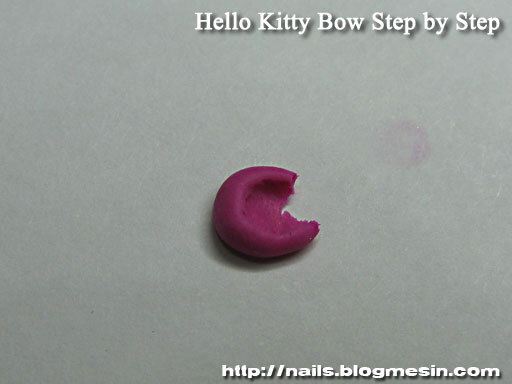 I am using artificial plastic nails, because I can put them in a cold place before baking the bows. The polymer clay become a little bit harder when kept in cold so it is easier to transfer the clay bows from the nail to the baking. Bake the bows following the instructions on the package. I am using original Fimo Soft because it doesn’t loose the colour after baking and the baked objects are a little bit flexible so you can bend the bows while gluing them to the nails. When the bows are cured you can paint them with transparent nail polish. It depends on you if you want to add the extra gloss. You can paint them when they are already attached to the nails, but I find it easier to do it now. Be careful during painting. If you take too much nail polish at a time you will pour the small details. 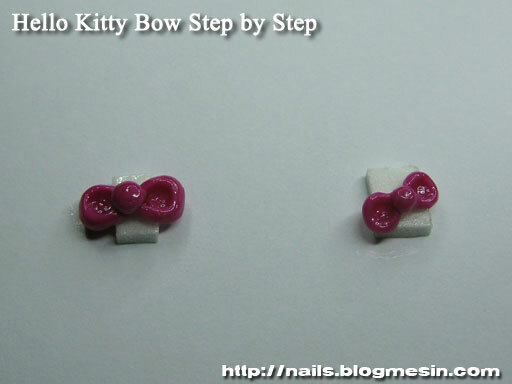 So this is how I make my Hello Kitty Bows for nail art. In the next post I will show how they look on nails.